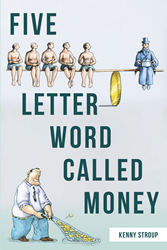 Recent release “Five Letter Word Called Money” from Page Publishing author Kenny Stroup is an in-depth book that tackles the influence of money in human lives. Kenny Stroup, friend to many and minister of God, has completed his new book “Five Letter Word Called Money”: a potent read that discusses the logic of wealth and its moral and spiritual effect on human nature. In this book, Kenny Stroup gives several examples of wealthy, well-known people whose lives were not affected by money, as well as everyday people. Readers will also see where money has affected people in all walks of life one way or another. Then they will see that money is not what matters, but rather how people treat other people and the love and kindness that is shown in all fashions, not just money. Published by New York City-based Page Publishing, Kenny Stroup’s insightful masterpiece reminds its readers of the importance of discerning one’s priorities to prevent further damage to the soul and heart that is brought about by unnecessary temptations. Readers who wish to experience this wise work can purchase “Five Letter Word Called Money” at bookstores everywhere, or online at the Apple iTunes store, Amazon, Google Play, or Barnes and Noble.